VEGAS HALL OF FAME HOCKEY COACH ROB PALLIN ANNOUNCED HE PLANS TO COACH IN HUNGARY THIS SEASON. HE WILL LEAVE LAS VEGAS THE LAST WEEK OF JULY. Years ago hockey coach Rob Pallin helped turned Las Vegas hockey around, putting it on a national map. 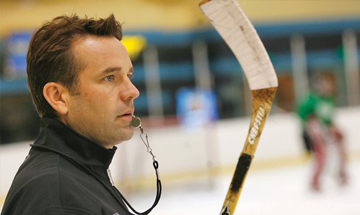 He has coached on the AA midget 18u/16u level, AAA midget 18u, UNLV college hockey, the ECHL level with the Las Vegas Wranglers. Pallin plans to leave the city for a new coaching opportunity in Hungary. Here is a look at his ‘early years’ of coaching when the AA Las Vegas Mustangs 18u were coming off a 4-21-0 season. //Coach Rob began skating at the age of three on ponds in Chisholm, Minnesota. He is the youngest of nine children. His father was a math and science teacher at a Catholic high school in Minnesota. Rob skated on local teams and then was recruited by Frank Serratore, now the head coach at the Air Force Academy, to skate on his Junior A team – the Austin, Minnesota, Mavericks. Rob, at 16, was one of the youngest skaters on the team. //While skating Junior A hockey, the Mavericks won the 1984-84 USHL championship and Rob was named to the U.S. National Junior team. He was recruited by many colleges and played initially at Minnesota-Duluth and later transferred to Western Michigan. //Following college, he skated in Germany and then found his way to Las Vegas when he played professionally for the Las Vegas Aces who played out of the now-closed Santa Fe Stations Ice Arena. Rob also skated roller professionally on the Pro Beach Hockey’s Heavy Metal team whose games were televised on ESPN and later with the Las Vegas Coyotes. //Serratore said Pallin was one of his best players. //”I picture Rob, and always will, as the up and coming youngster with the wonderful skills,” Serratore told author Joe McCauley who wrote about Rob in the book ‘Puck Dreams & Other Stories’ published by 1st Books Library in 2003. //Rob puts together the Triple Threat Line featuring Travis Roseberry, J.C. Caron and Spike Neely which was one of the most powerful lines in the West. //A young Eddie Del Grosso plays defense for the first time. //Powerful ‘Red Line’ of Josh Jasek, Adam Naglich and Eddie Samuels set 10 team scoring records. Each advanced to Jr. A level hockey. //Cody Fulwiler and Paul Lowden are the two best goalies in the West. Combined, the two had a club-record 10 shutouts. //First Las Vegas AAA midget level team. //Cody Morin top goal scorer. //2-2-1 at Pacific District Championships including a riveting 6-5 OT win over the Alaska All-Stars in a game played in Fairbanks. //Huge season for line of Anthony Greener, Conrad Trimbath and Kurt Long. //Beat AAA L.A. Jr. Kings minors in thriller 3-2 and then defeated AA Long Beach midget majors 3-0 to capture Tier 1 Southwest League Championship. //Chris Francis and Evan Zucker were leading goal scorers – with 31 apiece. Conrad Trimbath is named MVP. //For the 6th straight season, Las Vegas wins its opening game of the season. The Rebels beat the So-Cal Vipers 9-0. //Chris Francis and Evan Zucker set a club record by recording back-to-back hat tricks during the Labor Day Blast at Las Vegas. //In 5 away games, the Rebels score 45 goals and win all 5 games at the Duel in the Desert in Phoenix. //On Oct. 4, Las Vegas defeats the Cal Cougars 4-2 for coach Rob’s 200th career win. //Las Vegas wins all 5 games in Southwest League competition in Peoria, Arizona and is unbeaten in 10 straight. //Ryan King has 16-point weekend as Rebels go 4-1-0 in Southwest League action at the Glacial Gardens. Chris Francis gets his 5th hat trick of the season, tying record held by Adam Naglich. //Chris Francis scores 7 goals as Las Vegas wins all five games to capture the gold medal at the Silversticks Regionals in Portland during Thanksgiving weekend. //On Dec. 22, Rebels beat the Alumni skaters 7-4 before a big crowd in their annual charity game. //On Dec. 26, the Rebels beat the Phoenix Firebirds 2-0 win a Southwest League game and won their 30th game of the season. The Rebels, with Pallin as head coach, have won 30 or more games six straight seasons. //On Dec 29, the Rebels beat the L.A. Jr. Kings 6-5 to win all five SWYHL games and raise their unbeaten record to a team-record 18-0-1. //On Jan 16, the Rebels beat Cal North Stars 7-2 to win MLK tournament, raise record to 40-6-1 and extend unbeaten record to 24 straight. //Rebels go unbeaten 27 straight games, a new team record. //Rebels beat L.A. Hockey Club AAA 16u 3-2 to win the gold medal at Kings Challenge Cup during President’s Day weekend in El Segundo, Calif.
//Rebels go 5-0-0 including thrilling 5-4 OT win over Cal North Stars in gold medal game to win the Pacific District Regional Championship. //Rebels 3-2-0 at U.S. Nationals, beating New Jersey Devils 6-5 OT in Final Eight game before losing 3-2 to Butler Valley, Pa. in a thrilling Final 4 game in Pittsburgh. Rebels broke over a dozen records this season including most goals, 404, and had nine skaters with 20+ goals for the year. Chris Francis was top scorer at U.S. Nationals with 7 goals, 6 assists.